Oh my gosh, I am so excited to announce this giveaway- I could pee. Yes, I measure my excitement in bodily functions. It's not weird- it's scientific! ANYWAY. 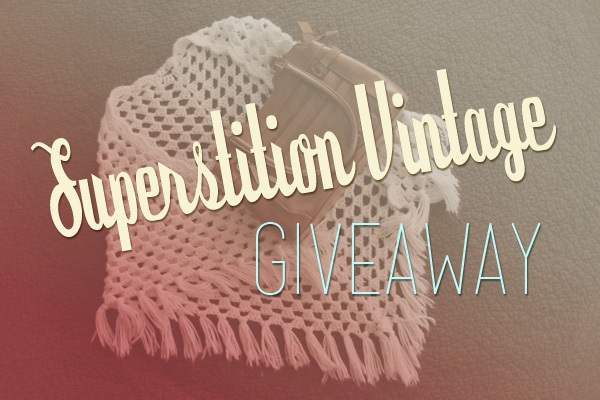 Adrian, the lovely lady behind the blog Adrian Loves Owls, and one of the vintage darlings behind Superstition Vintage, is giving away two awesome pieces from her shop today! She has an amazing eye for all things vintage and pretty, so I'm super honored she wanted to do a giveaway on Cheeky Cheeky! If you haven't visited Superstition Vintage, do it now! Amazing vintagey goodness. Again... resisting the urge to enter the giveaway myself. Must practice restraint!!! 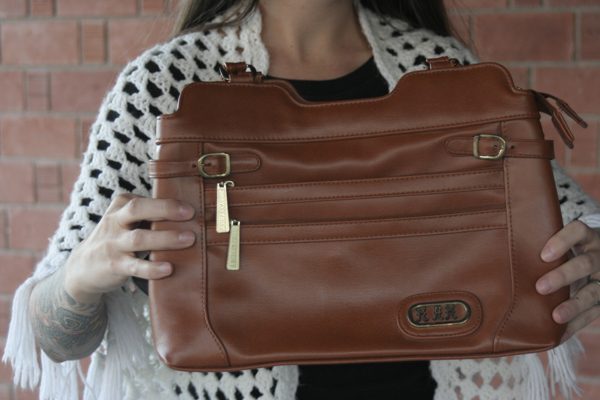 Adrian will be giving away a vintage knit shawl & vintage purse with matching wallet! Swoon. 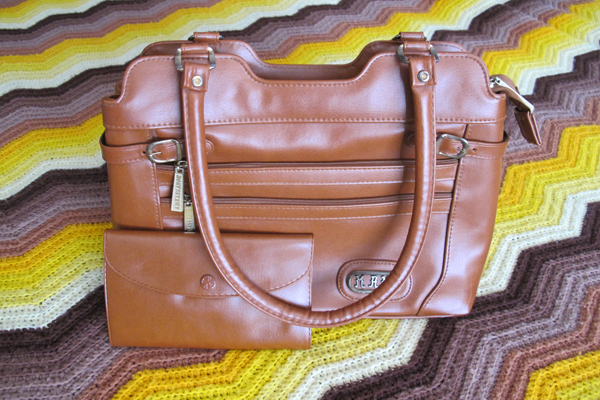 I'm a sucker for anything cognac, so I'm kind of obsessed with the purse and wallet combo. Cognac is basically the best color ever- it goes with literally everything... And even if it doesn't, I just act like it does and kick anyone who says my outfit doesn't match. Cognac goes with everything. New life rule. 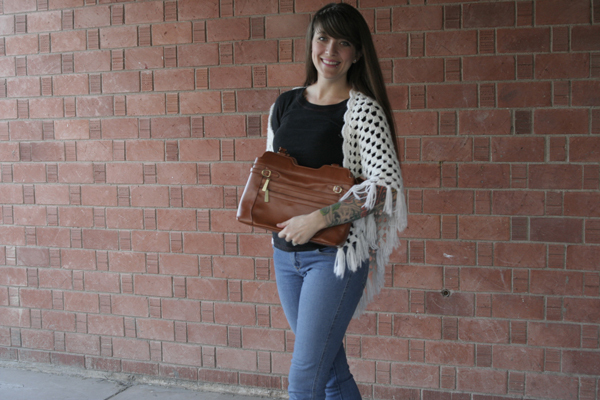 Oh, and this knit shawl would pretty much be the perfect addition to any summer night. I can just see curling up with it by the bonfire, making smores. Gah, is it summer yet?!?!! Unfortunately, Adrian herself does not come with the shawl & purse. Bummer, I know! Isn't she pretty? I want her hair!! 1. Be a follower of Adrian Loves Owls and leave a comment below telling us you do! 2. Be a follower of Cheeky Cheeky, visit Superstition Vintage & leave a comment below telling us what your fave item is from the shop! 3. 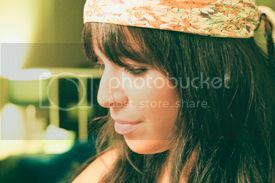 Follow Superstition Vintage on Twitter & leave a comment telling us you do! 4. Tweet about the giveaway and comment with a link to the tweet! 5. Follow Cheeky Cheeky on Twitter & leave a comment telling us you do! Six total ways to enter! Awesome, right? This giveaway is open to everyone and ends on Friday, May 4th (the day before the happiest holiday of the year... Cinco de Mayo!) Good luck!!! BRITTANY FROM ITSY BITTY THINGS! Congratulations, girl!! Follower of Cheeky Cheeky, I would totally love either the "Vintage Dress in Mint with collar and swirly pattern" OR the "Vintage White Short Sleeve Blouse"... I'm not sure I could pick an absolute favourite! Follower of Superstition Vintage on twitter (username @jaysharps)! Following Cheeky Cheeky on twitter (username @jaysharps)! following both. I like the items she has up for the giveaway. 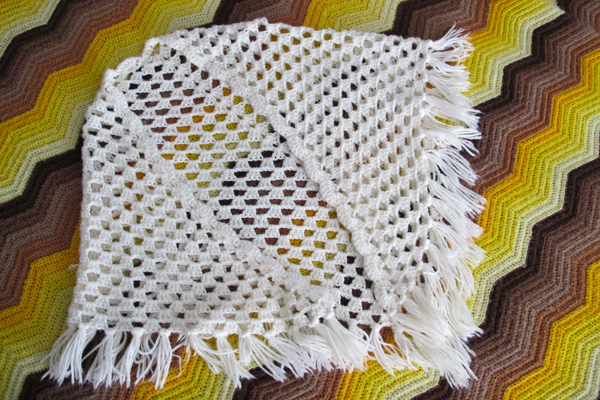 the shawl is super cutes. I've been following Cheeky Cheeky on Bloglovin' for a few weeks now. My favorite item in Superstition Vintage's shop is probably the Vintage Striped Skirt. Love those colors and it even has pockets! I follow Cheeky Cheeky with Bloglovin! I love the Vintage White Short Sleeved Blouse on Superstition Vintage's Etsy! I follow Cheeky Cheeky on Twitter! i'm definitely a follower of adrian loves owls - thats how i came across her blog! and she is adorable! i'm a follower of you as well. and my fave item in the store are these vintage keds. i have a keds addiction! i also follow cheeky cheek and my favorite item are the white vintage slip one sandals! I've become a follower of Adrian Loves Owls! Following Superstition Vintage on Twitter. I'm a follower of Adrian Loves Owls! I'm following Cheeky Cheeky and my favorite item is the Vintage Pink & Teal Plaid Blouse! I'm a new follower to Cheeky Cheeky! I visited Superstition Vintage and *love* that vintage purple dress. Followed Cheeky Cheeky on twitter! I follow Adrian Loves Owls! I love the Bear Wallow Trail Blouse! Following Adrian Loves Owls! My favorite item in the shop is the pink and teal plaid blouse-it's just too adorable! I'm following Adrian love owls! I'm loving the snakeskin purse at Superstition vintage! yay thank you both!! I follow on bloglovin. & I want Adrian's hair too, sooo pretty!! And following Cheeky Cheeky. Love the white slip on sandals. OH MY. I need these pretties in my life, such an awesome giveaway! I follow her blog! I also follow her on twitter! And of course i follow you on twitter, girly! I love the vintage black dress on etsy. Love the giveaway items as well, the purse is super cute! !